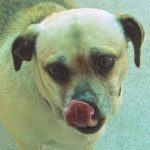 There’s one thing about being a stray dog that I know for sure: It’s scary! 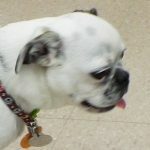 It can also be painful. 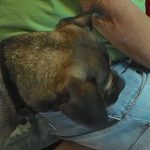 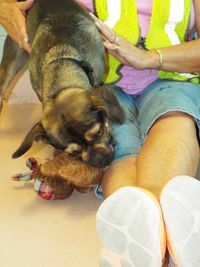 When I was rescued by the highway, I had cholla needles in my mouth and on my legs. 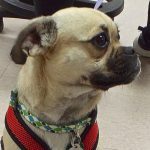 Needless to say, I’m grateful to be safe now. 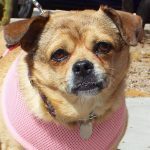 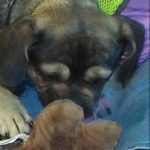 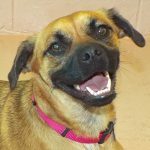 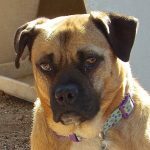 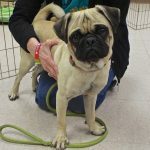 Oh, I love the great outdoors as much as any little Pug mix female (which is what I am), but I want to enjoy those times with my special someone and then share the comforts of home. 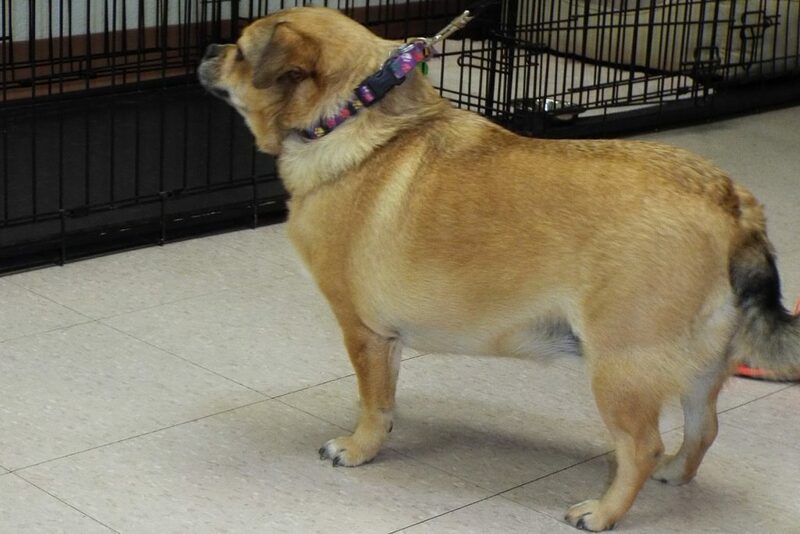 I’m good on a leash and at 23+ pounds I’d do well to lose a few, so regular exercise along with a healthy diet are right up my alley. 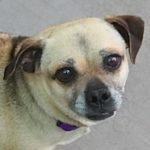 I’m a 4-year-old with lots of love to give for a long time ahead; please let me give it to you. 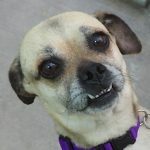 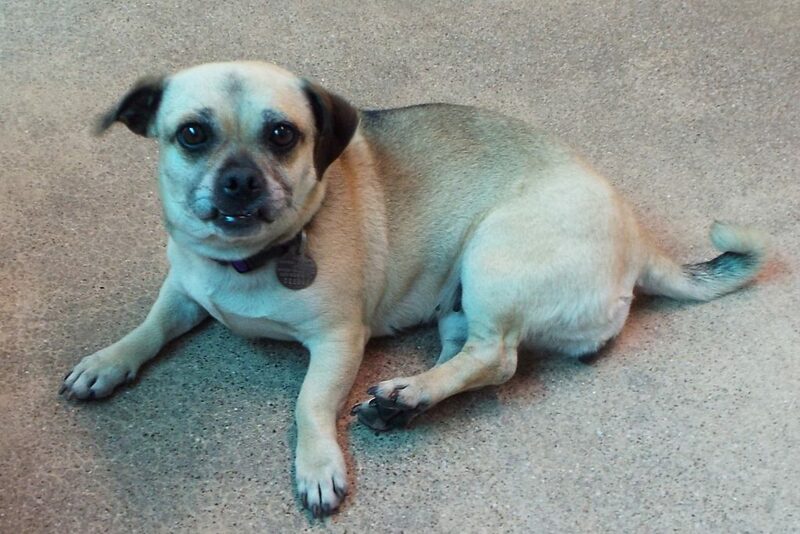 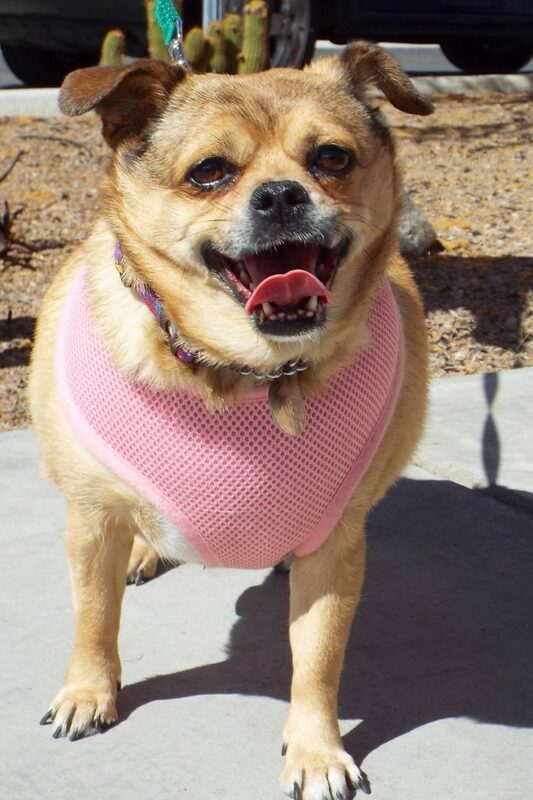 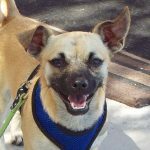 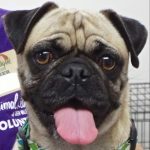 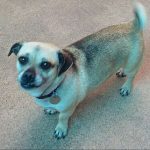 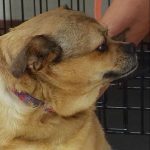 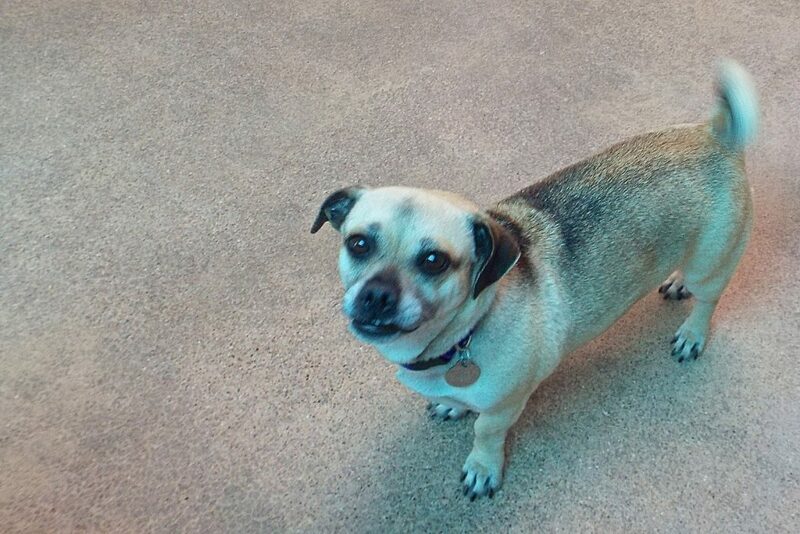 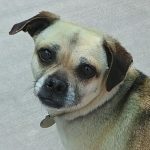 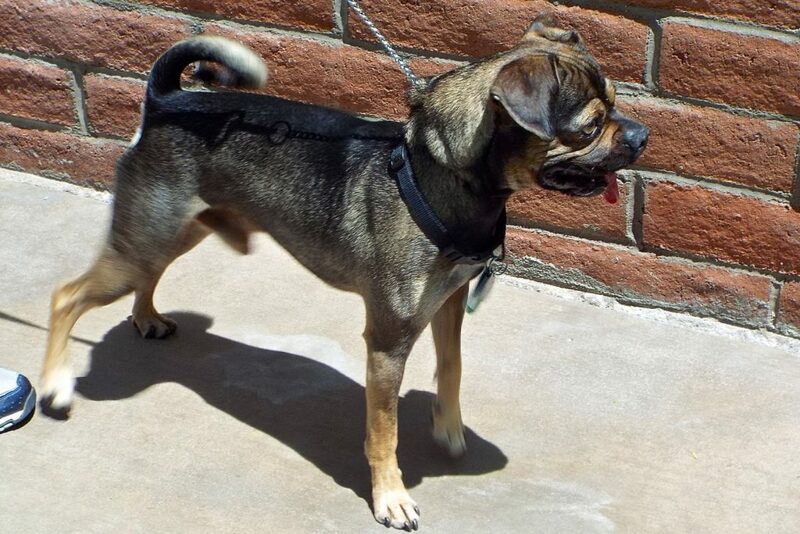 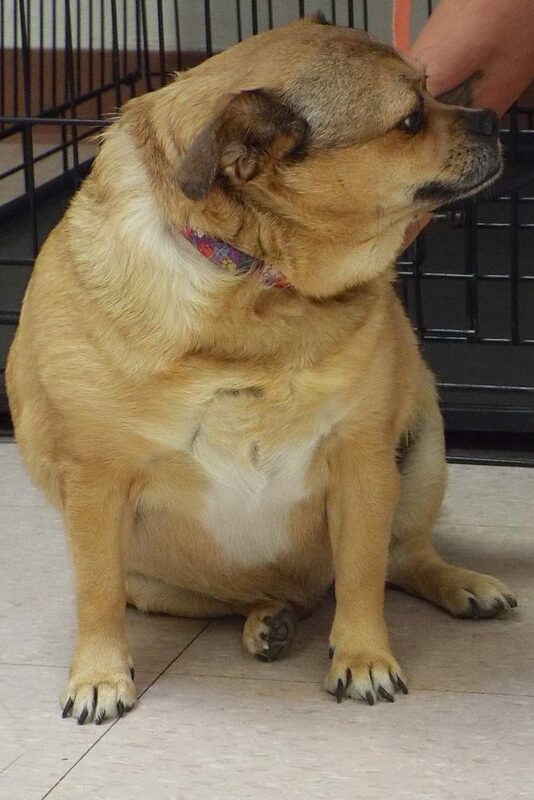 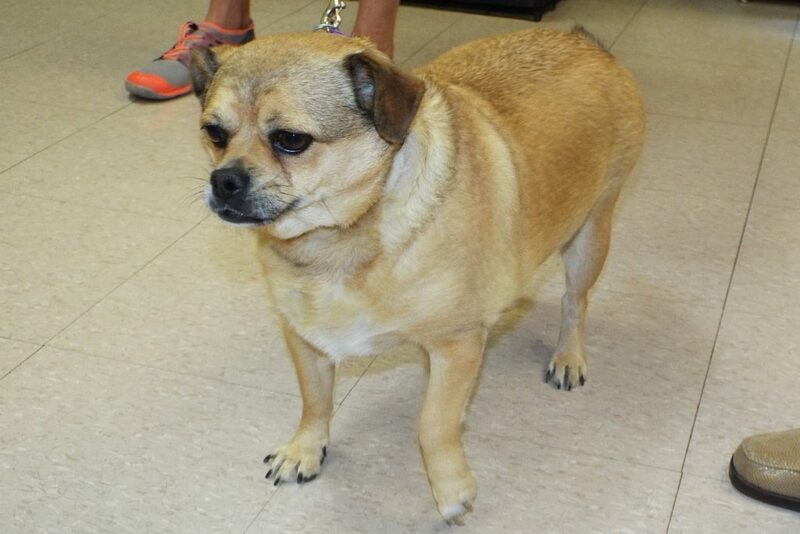 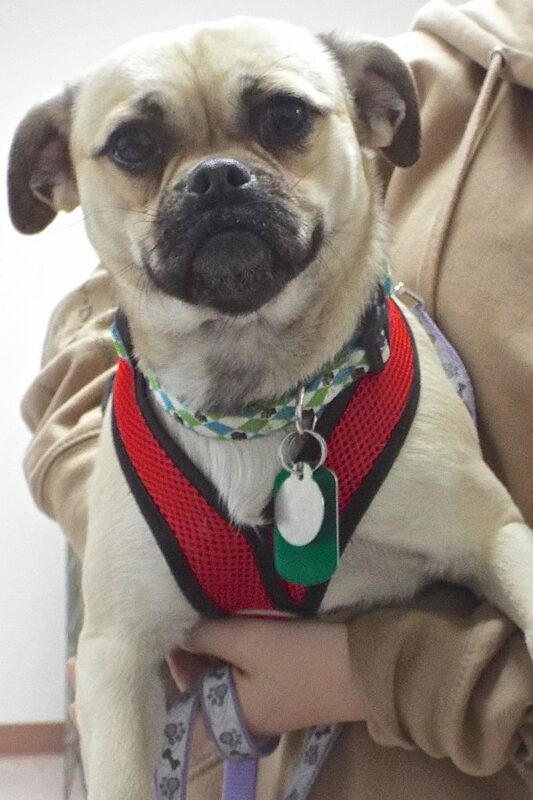 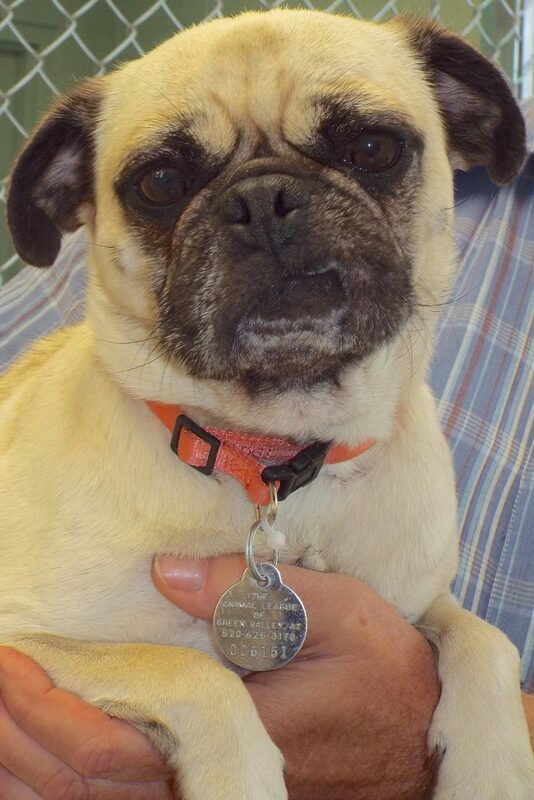 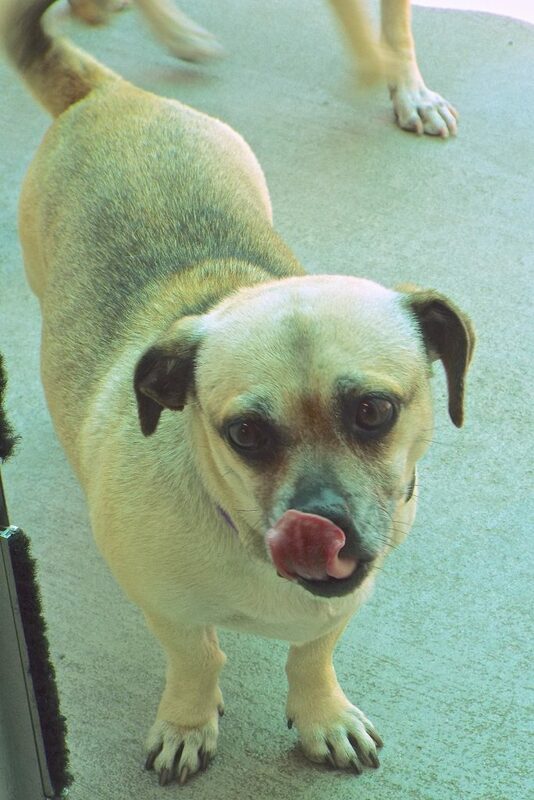 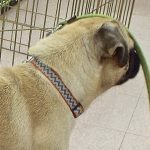 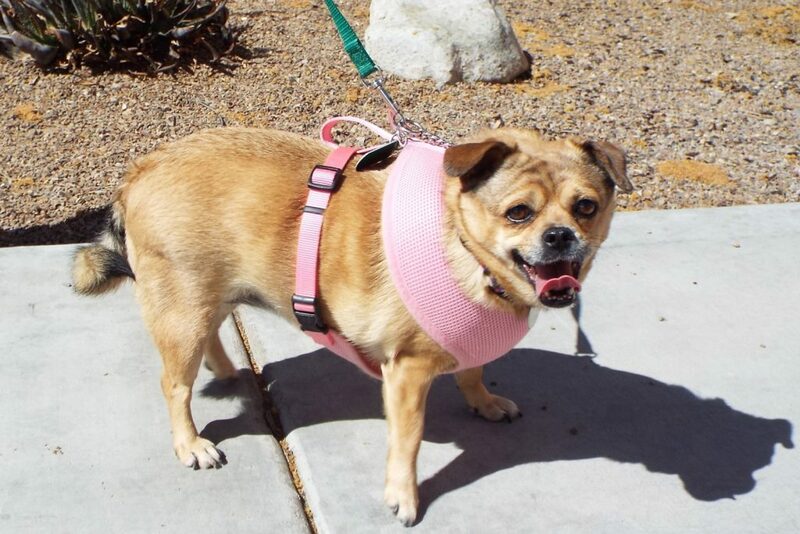 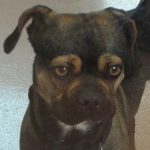 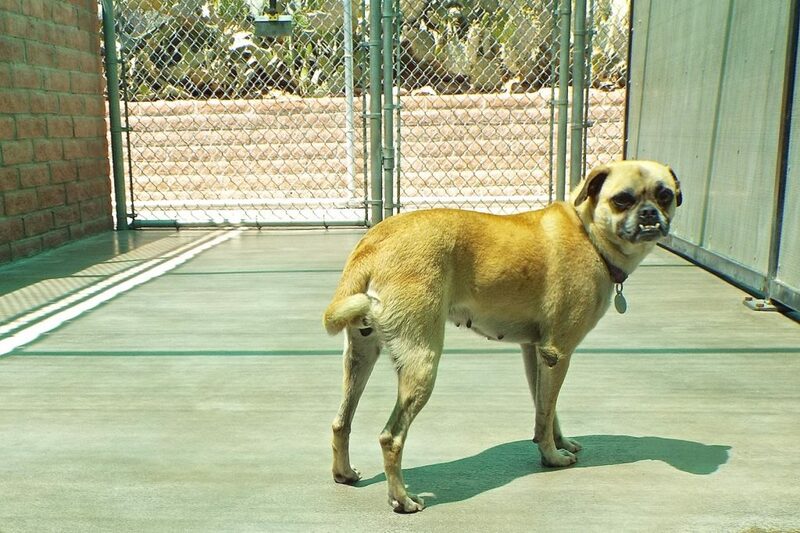 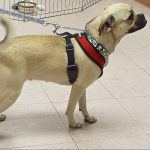 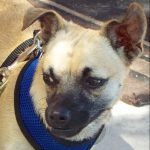 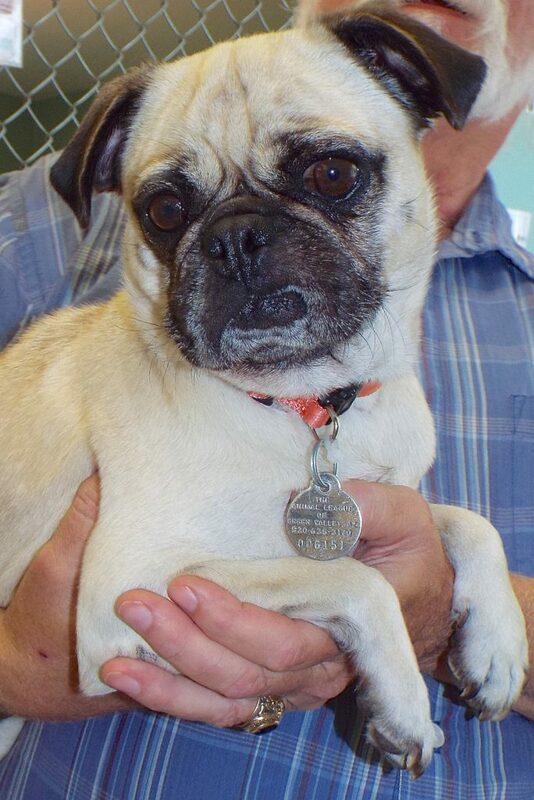 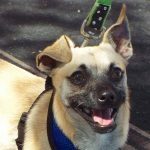 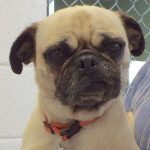 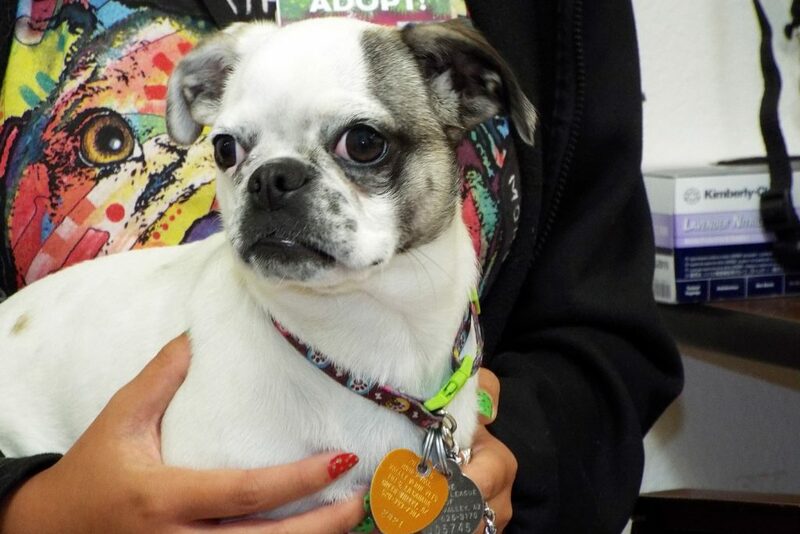 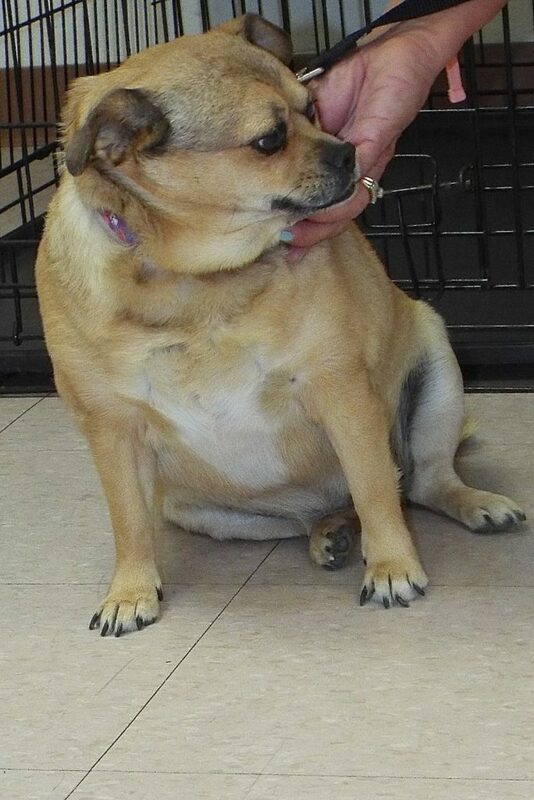 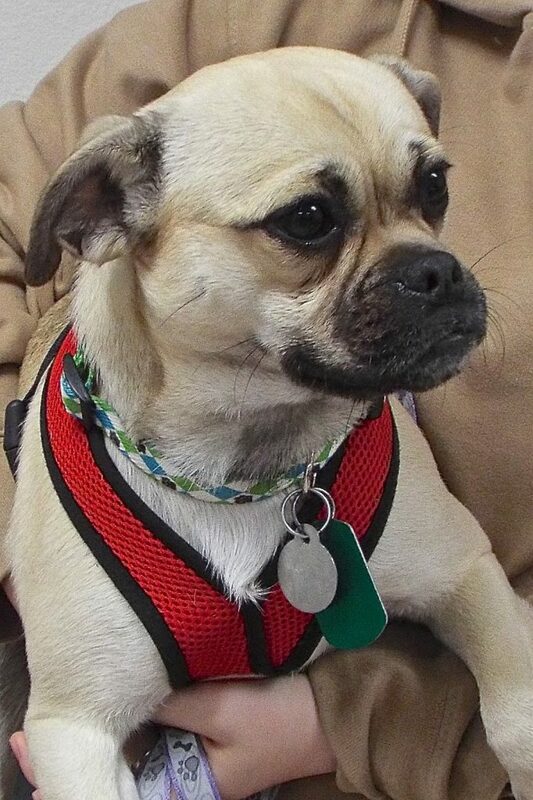 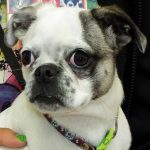 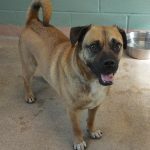 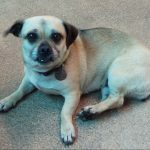 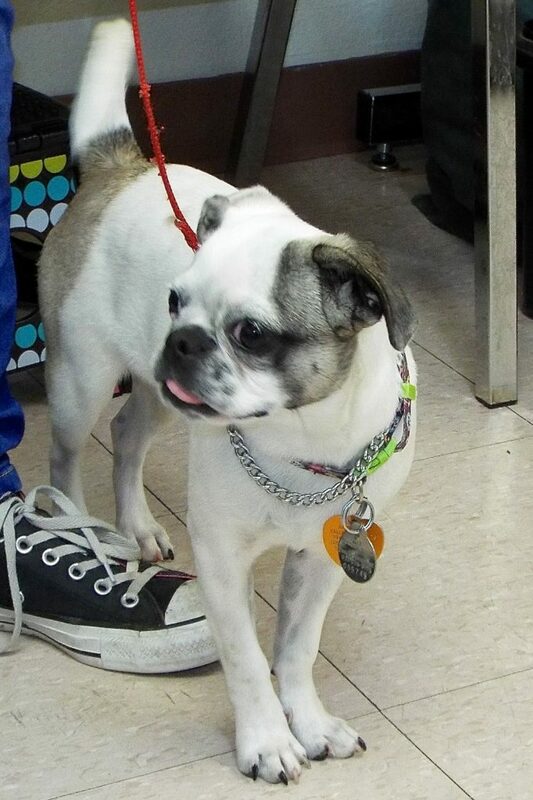 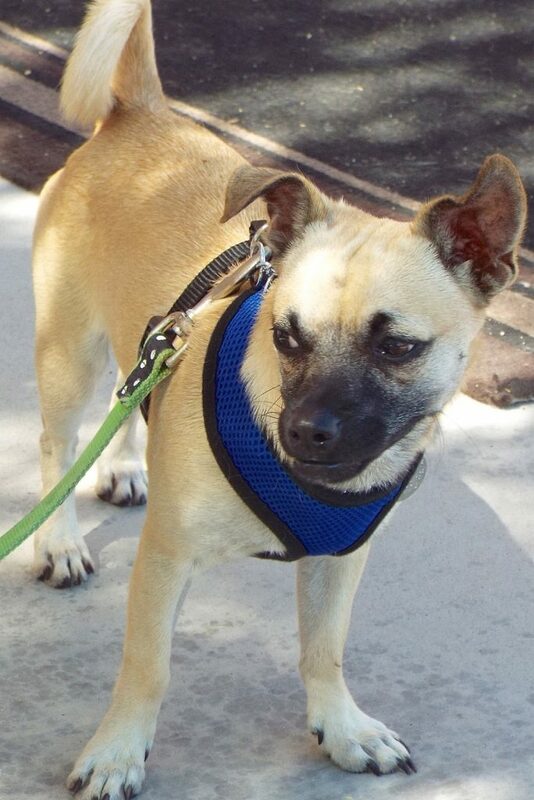 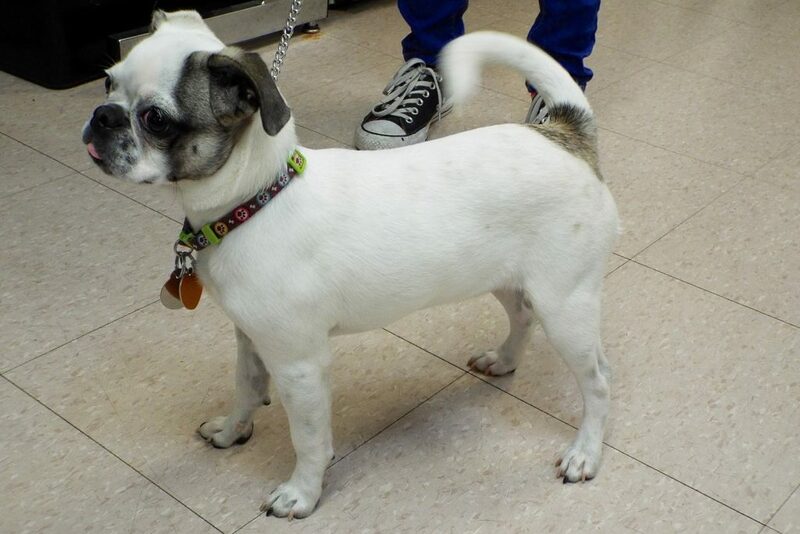 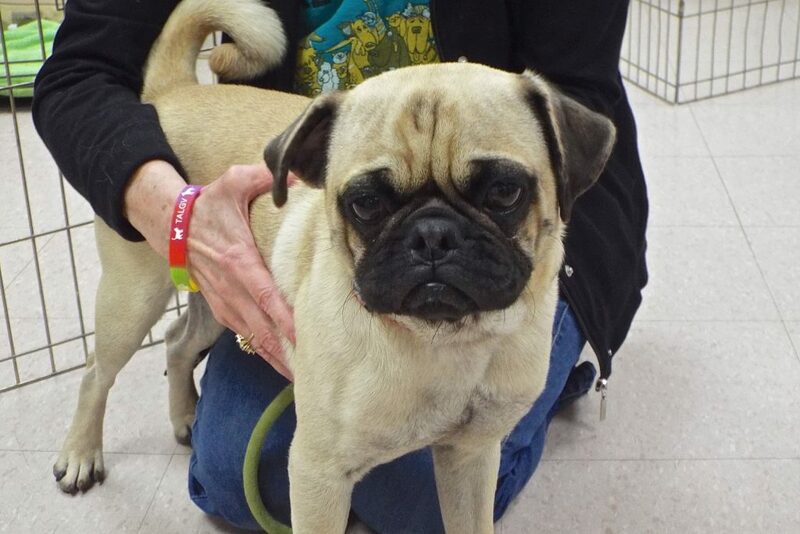 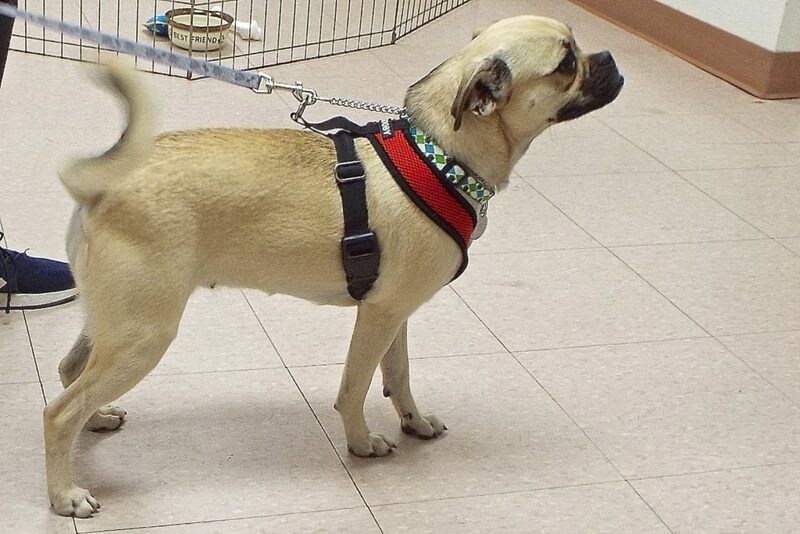 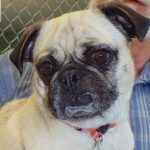 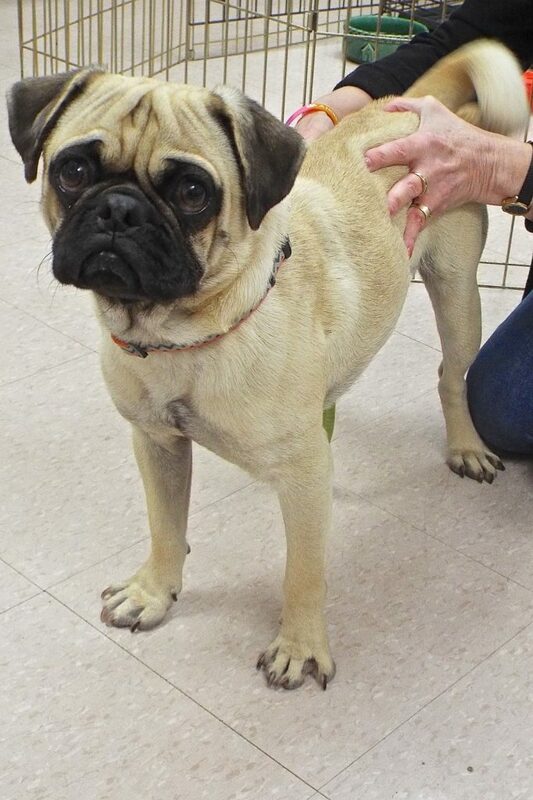 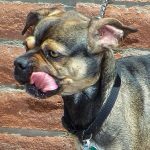 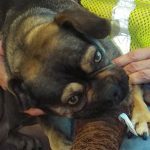 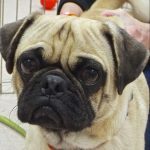 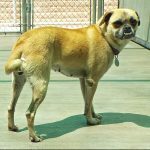 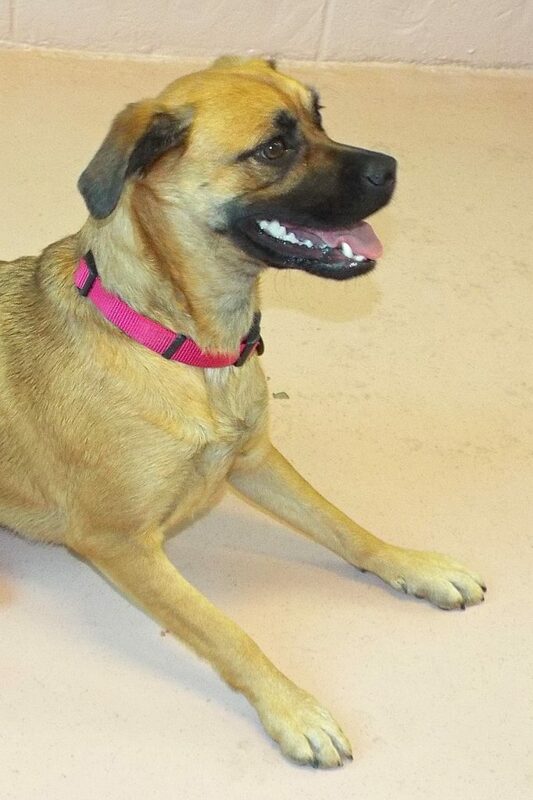 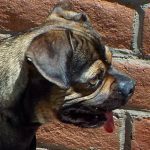 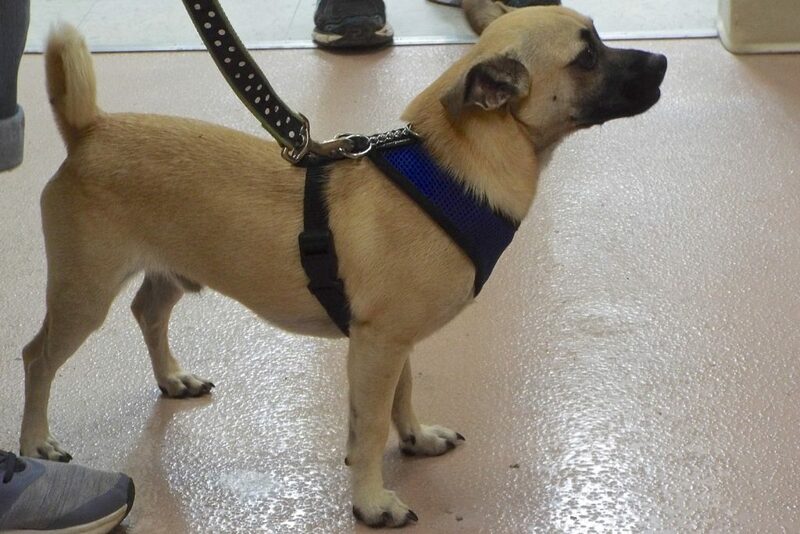 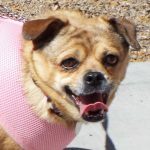 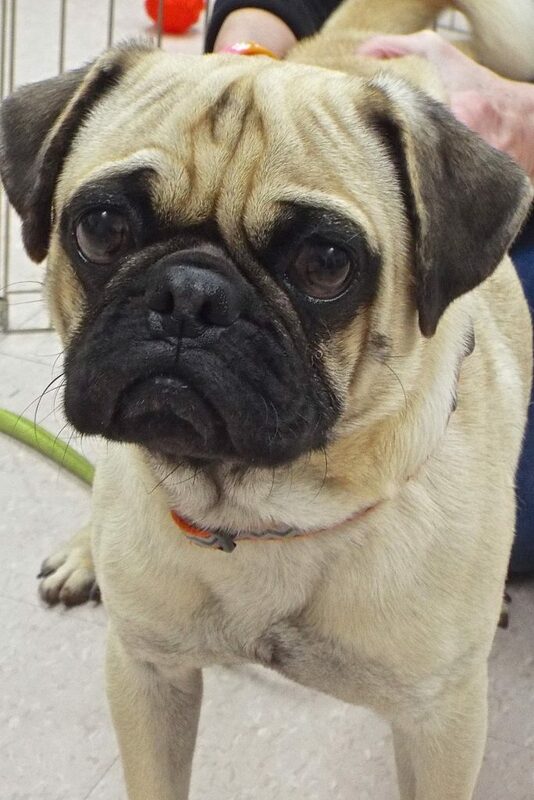 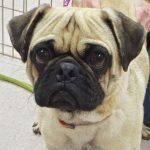 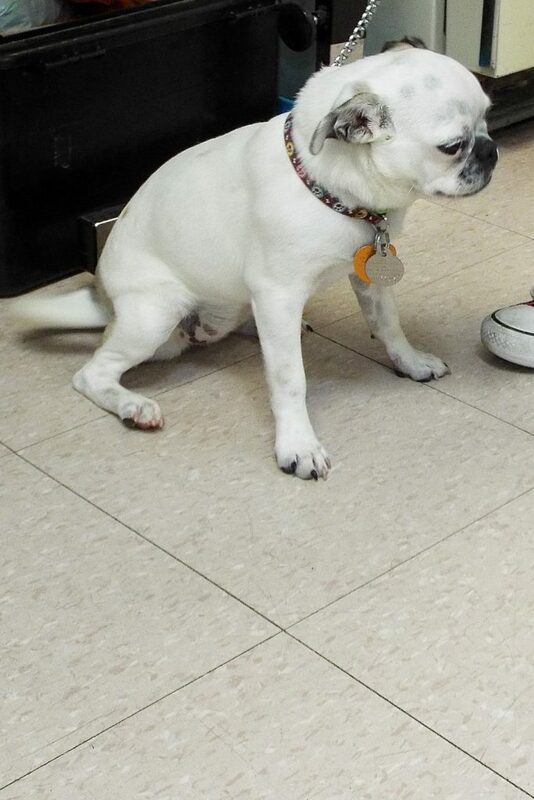 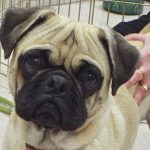 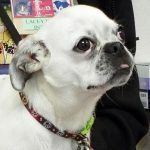 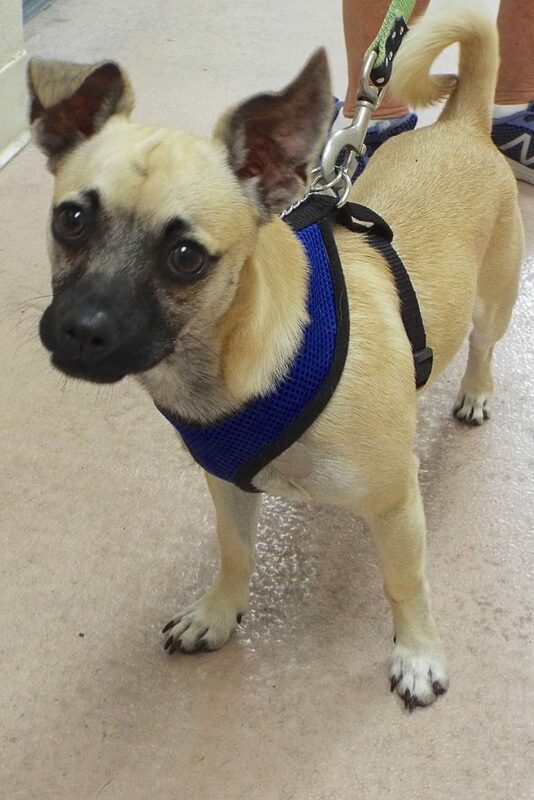 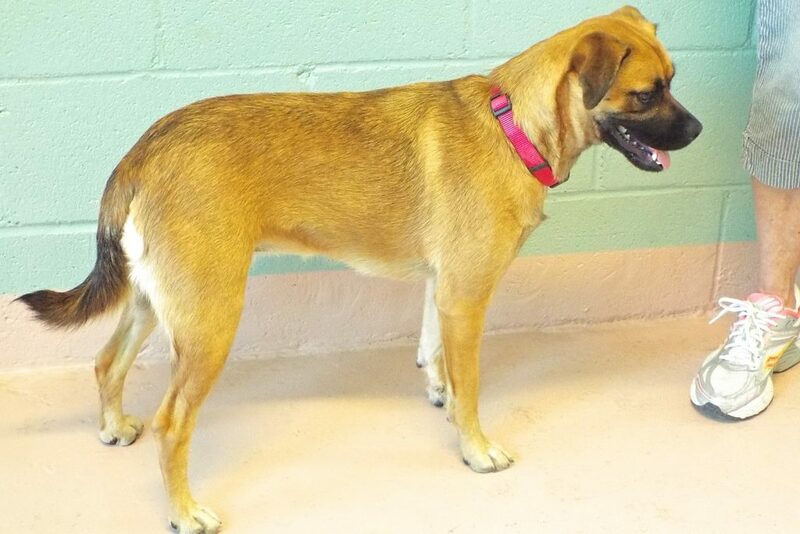 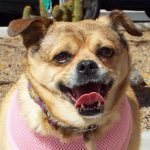 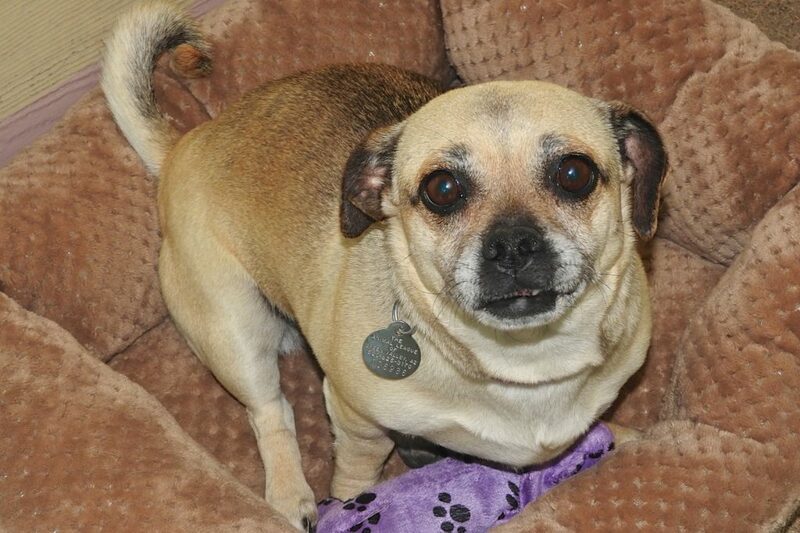 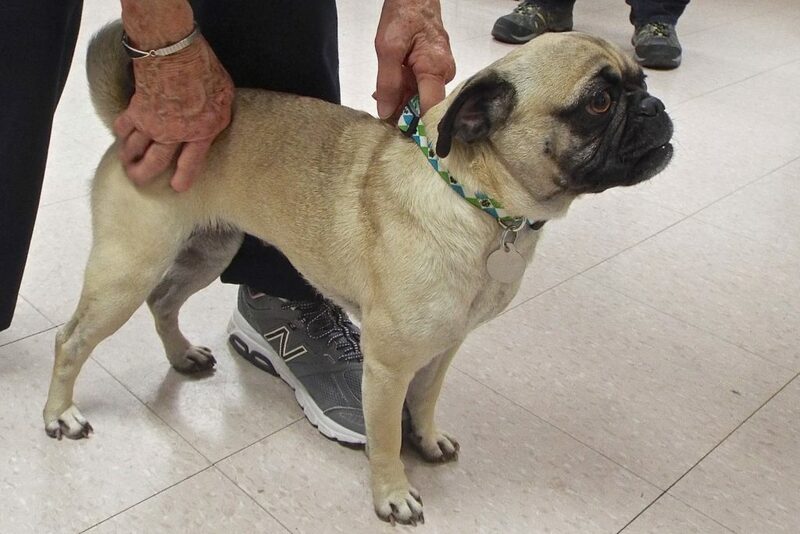 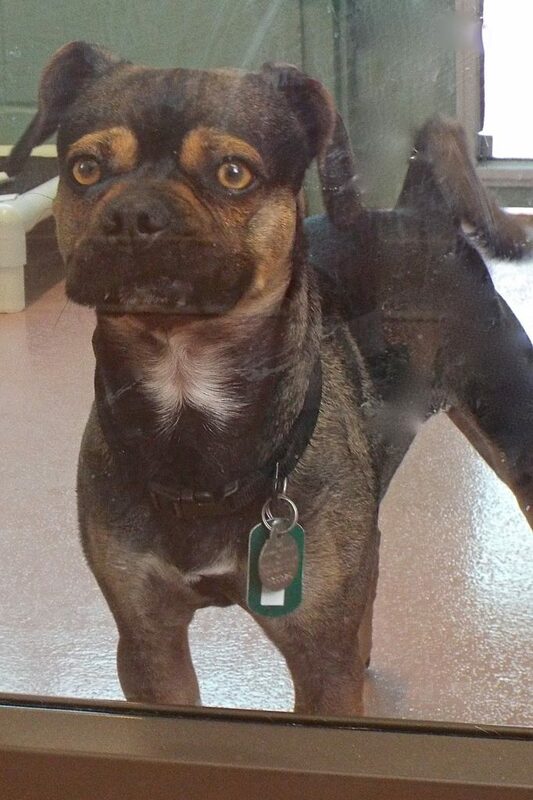 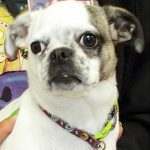 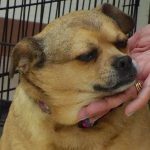 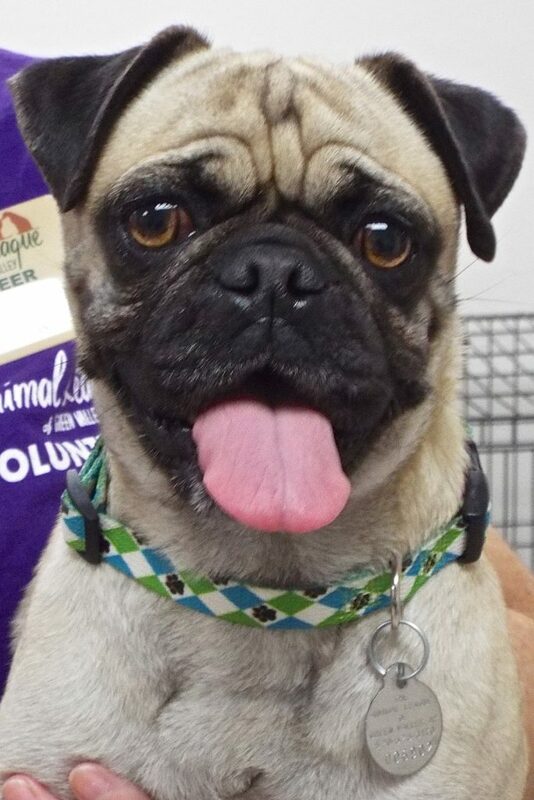 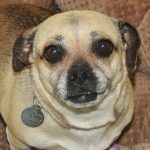 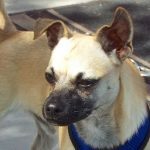 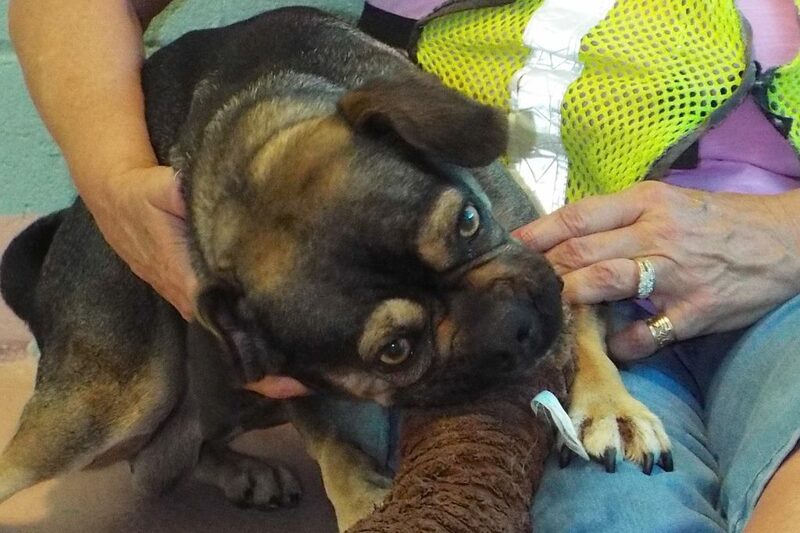 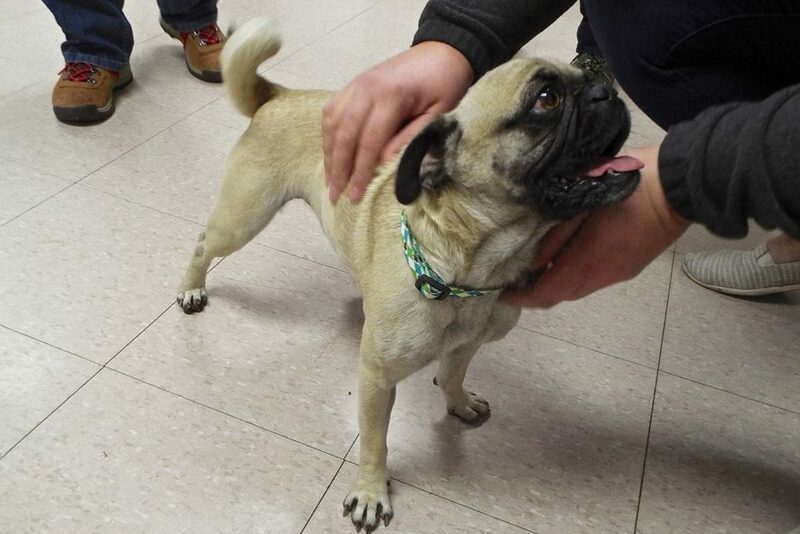 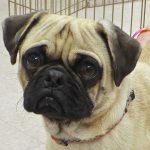 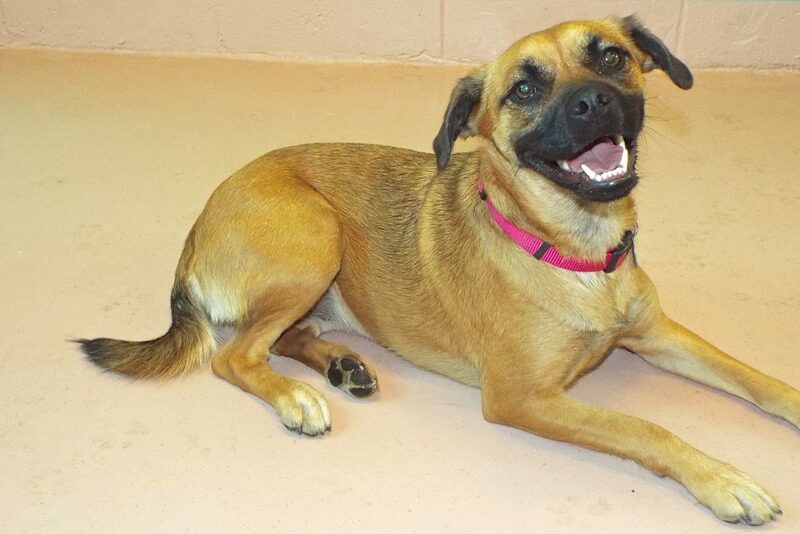 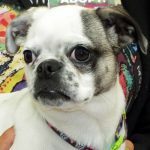 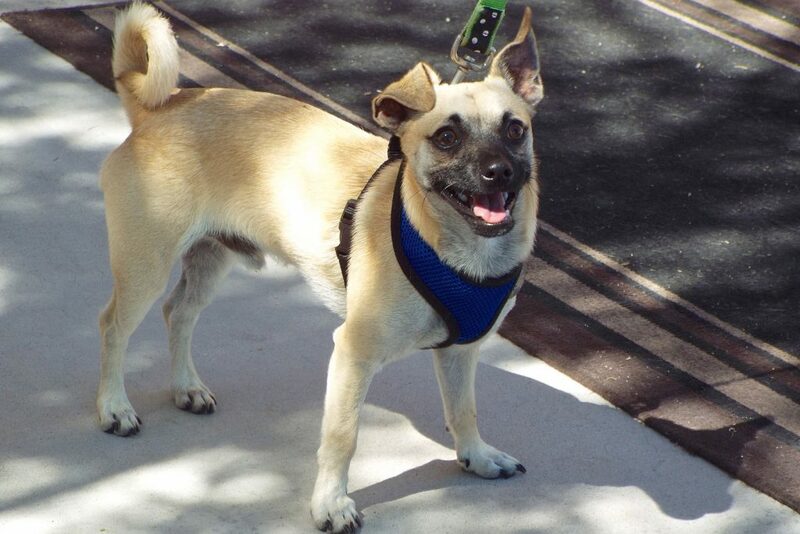 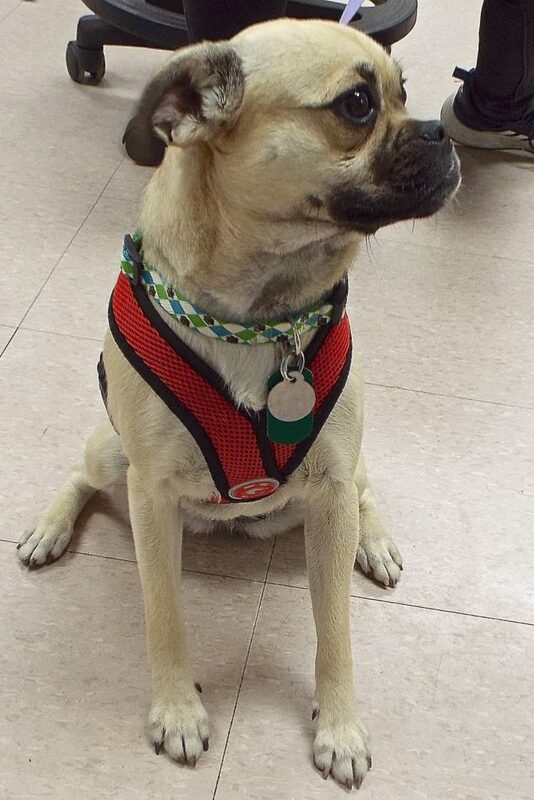 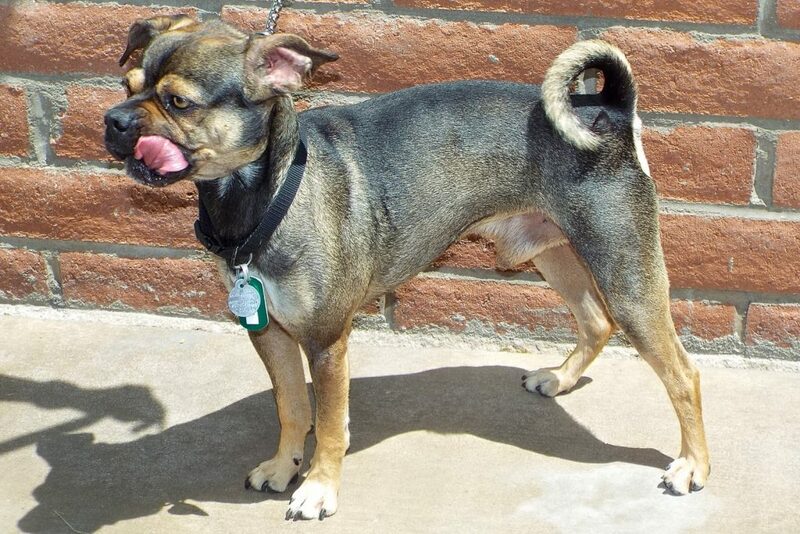 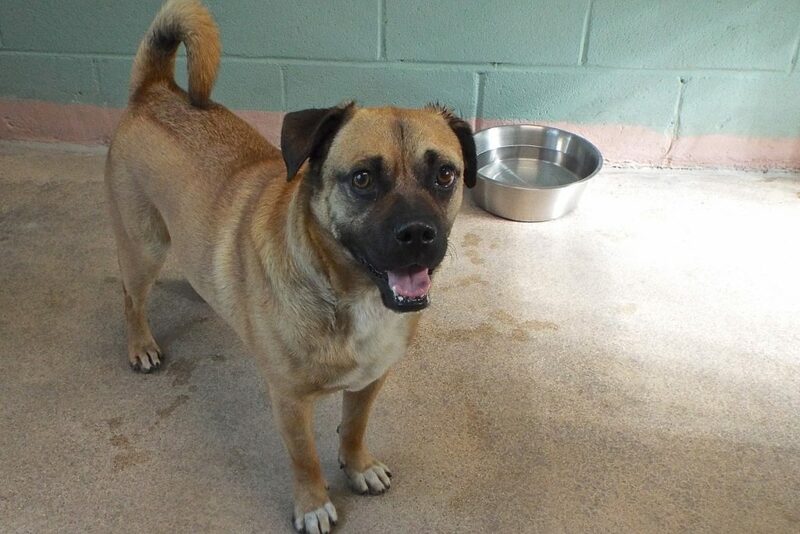 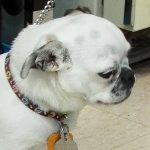 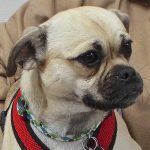 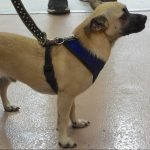 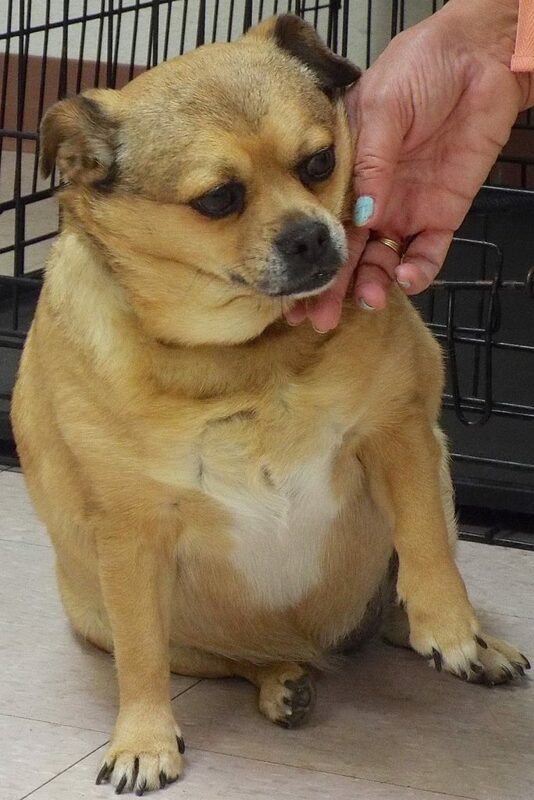 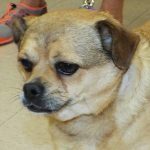 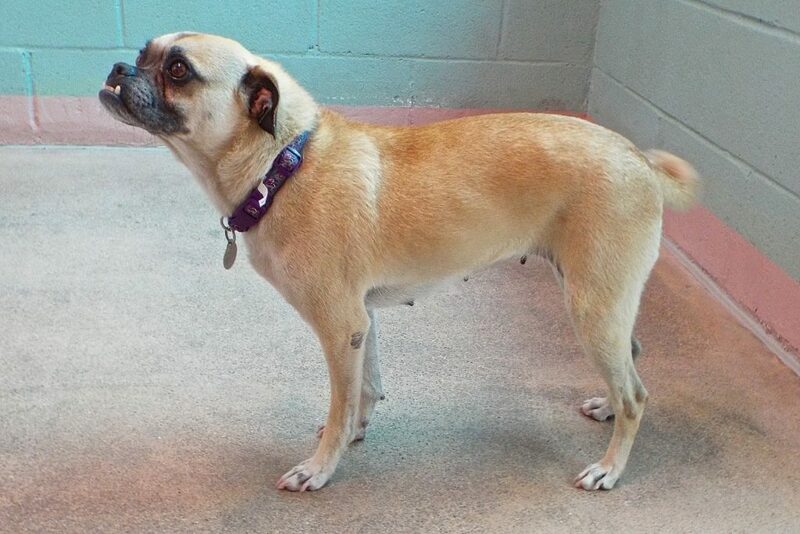 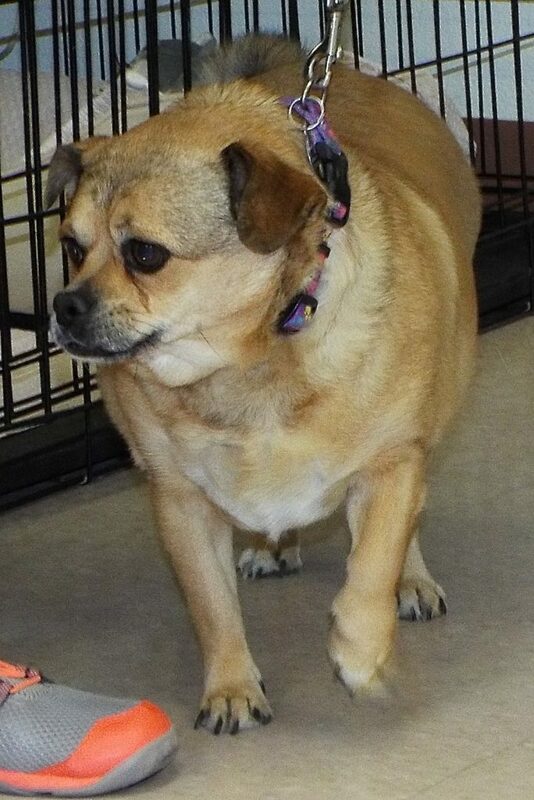 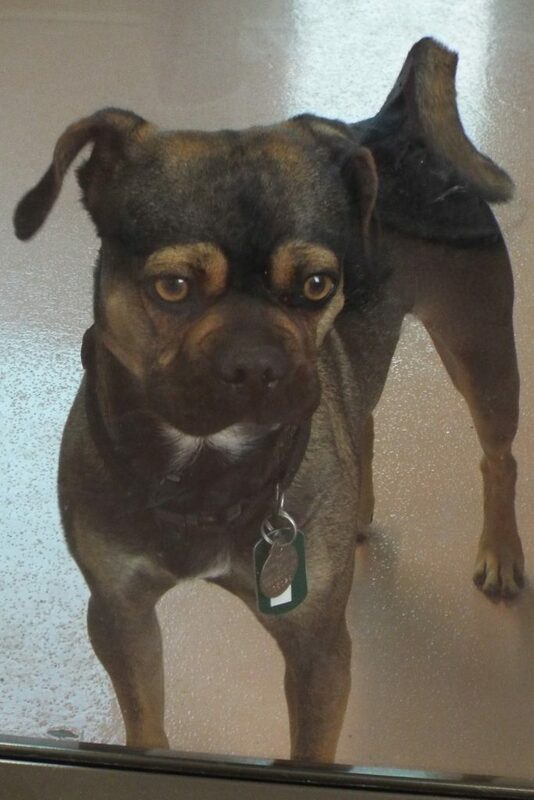 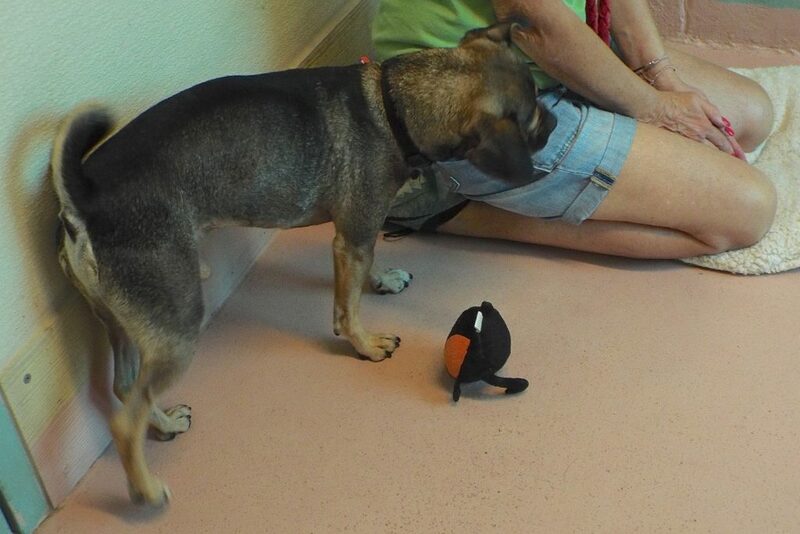 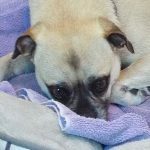 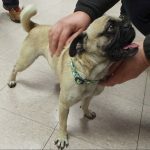 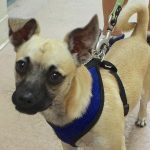 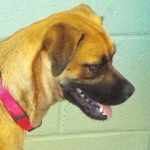 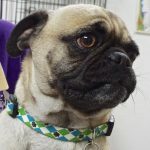 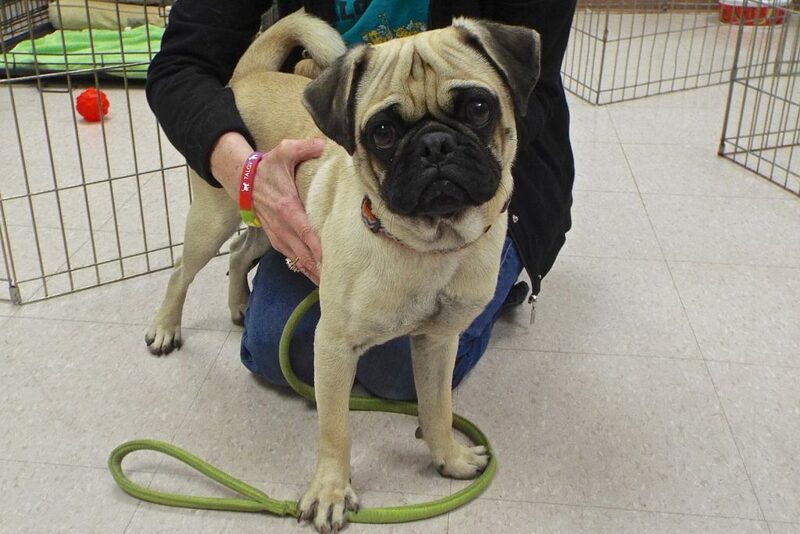 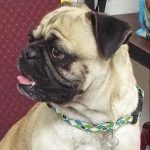 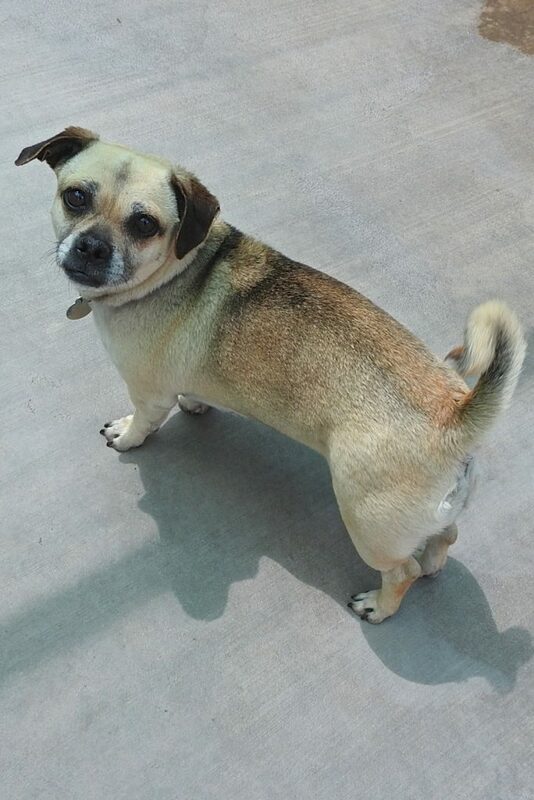 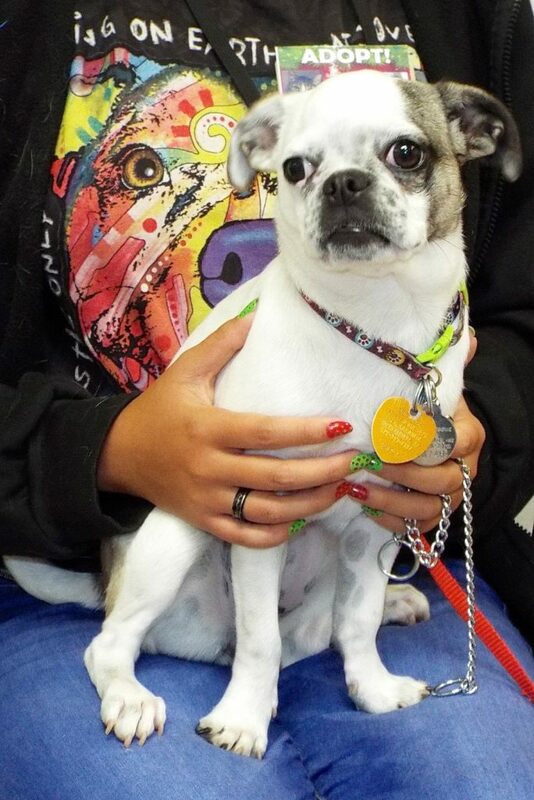 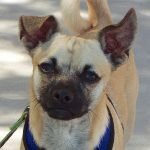 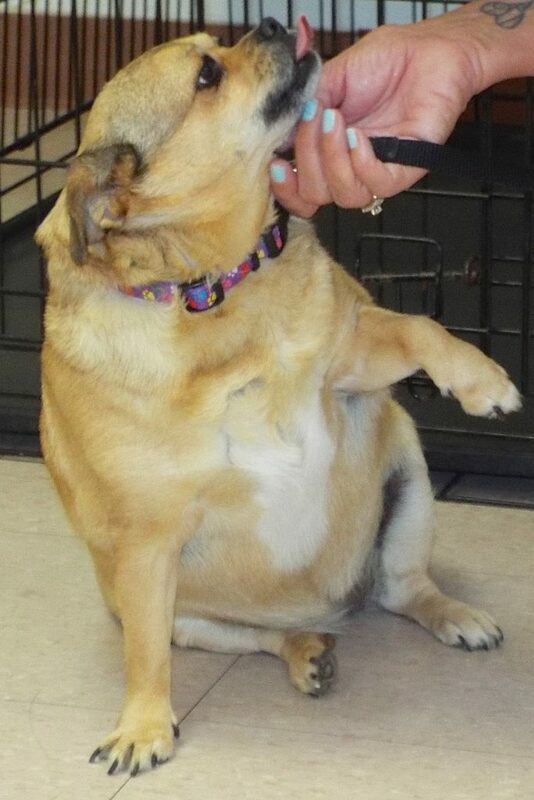 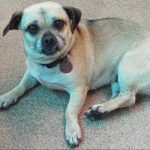 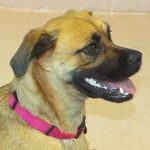 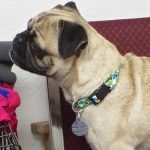 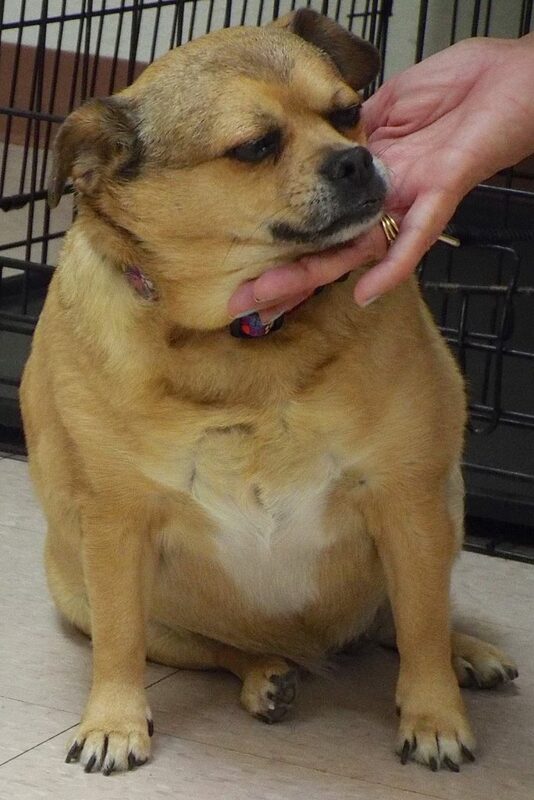 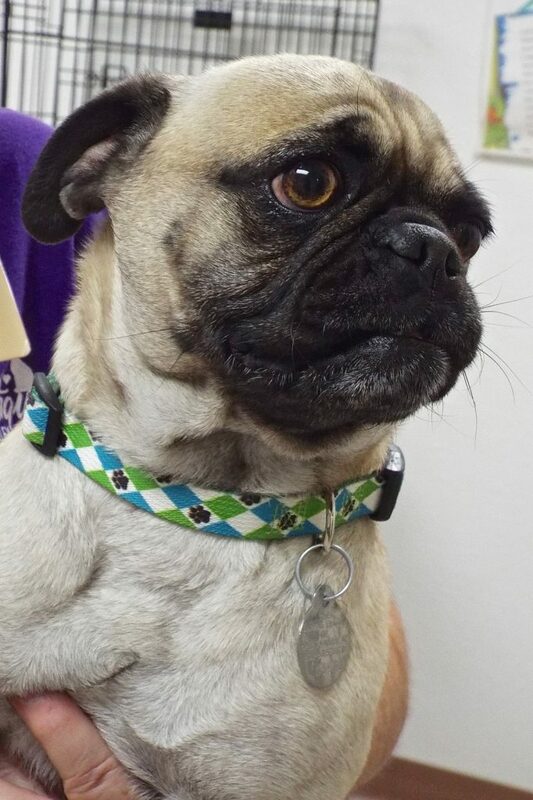 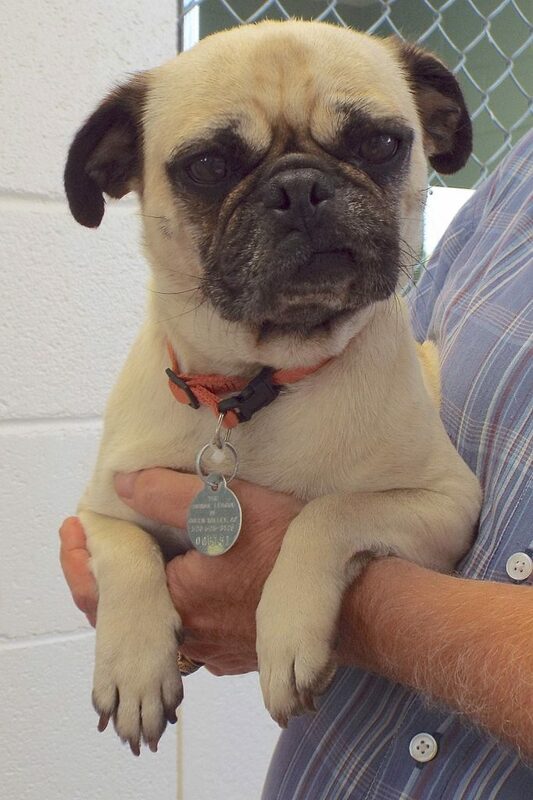 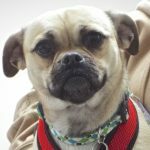 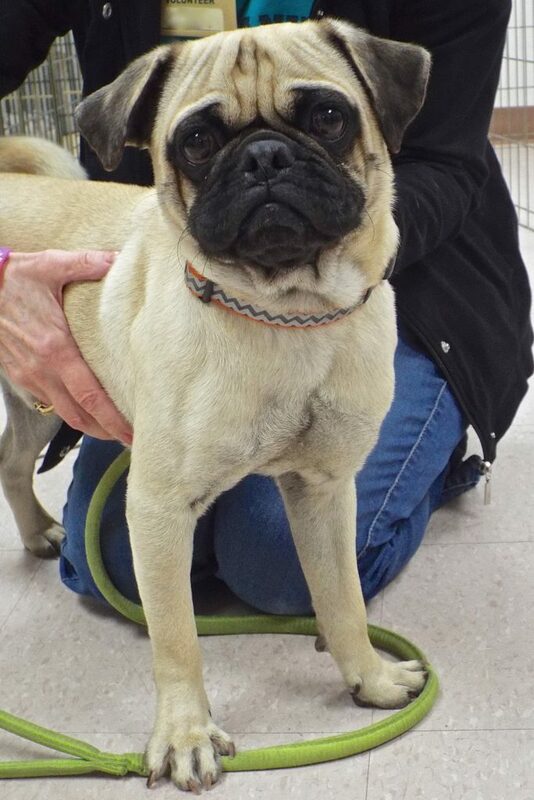 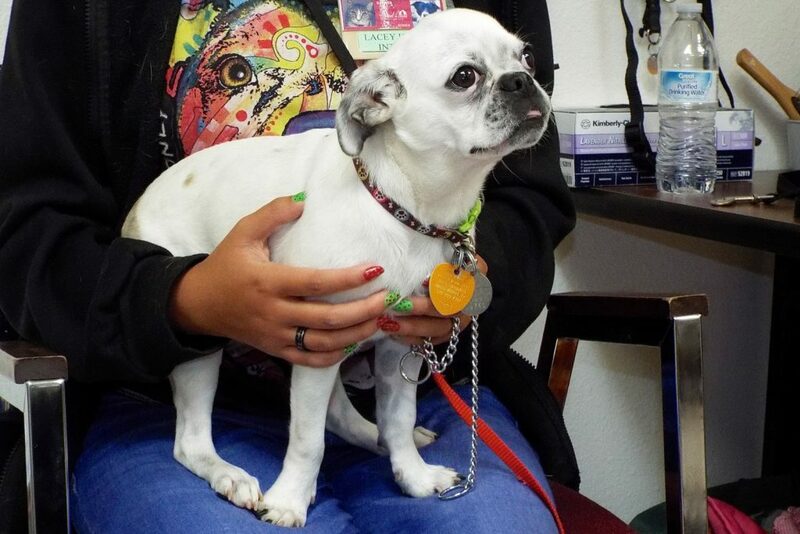 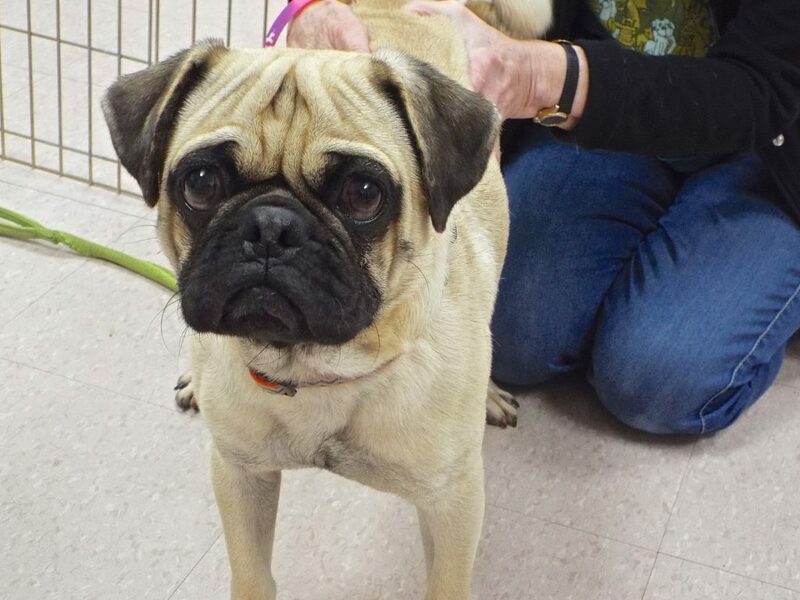 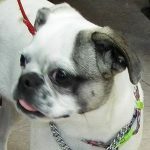 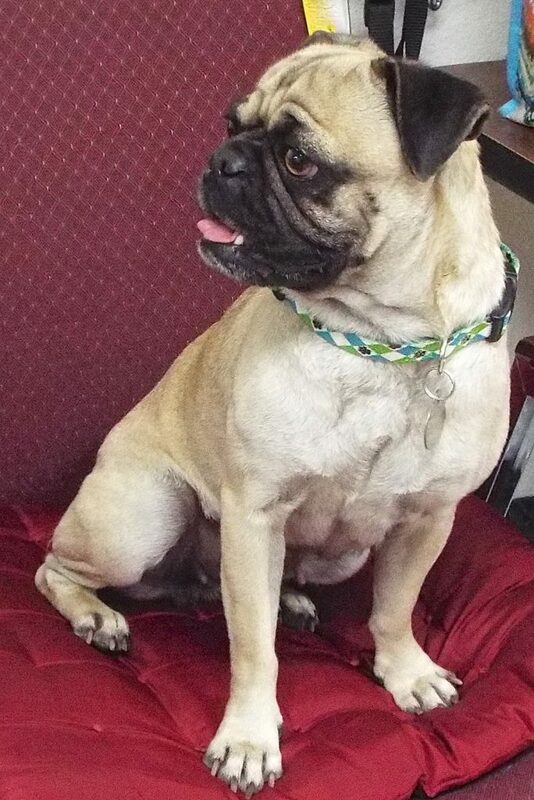 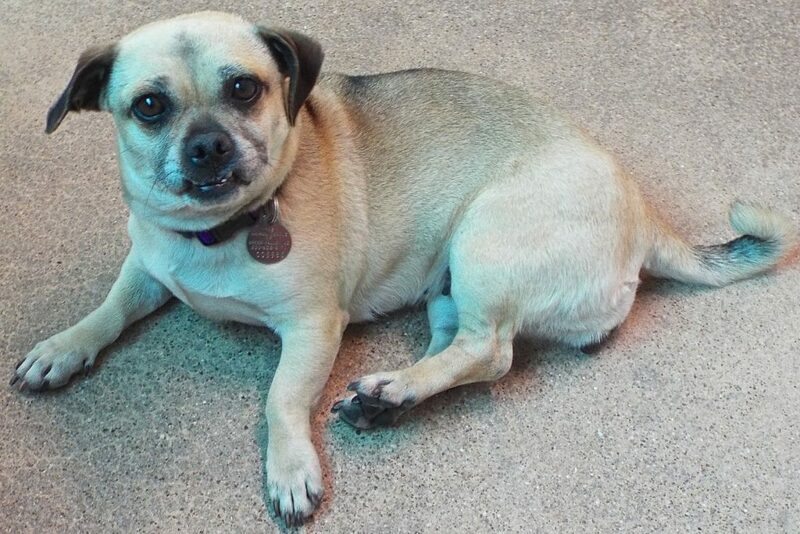 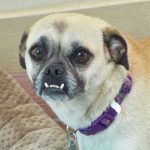 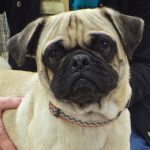 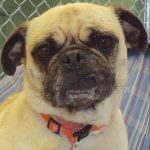 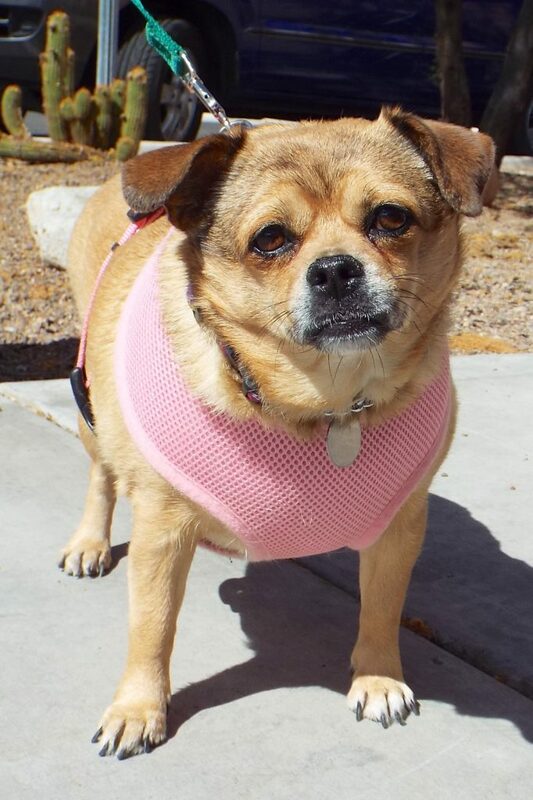 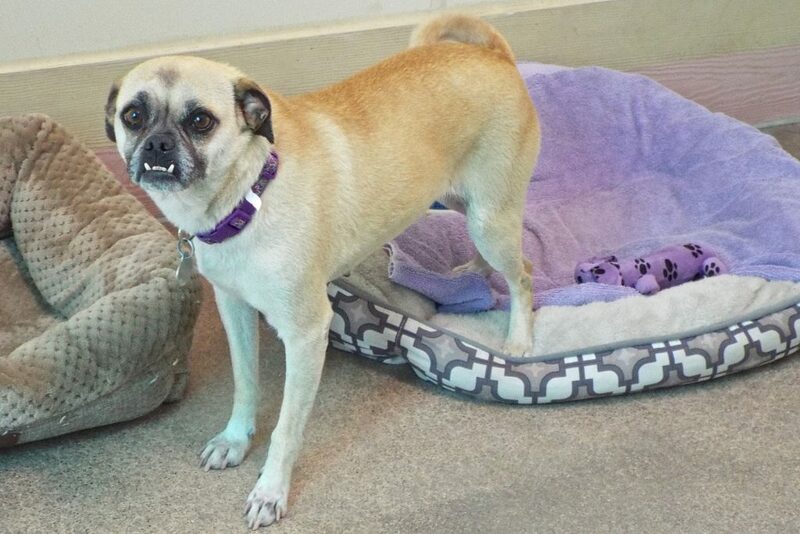 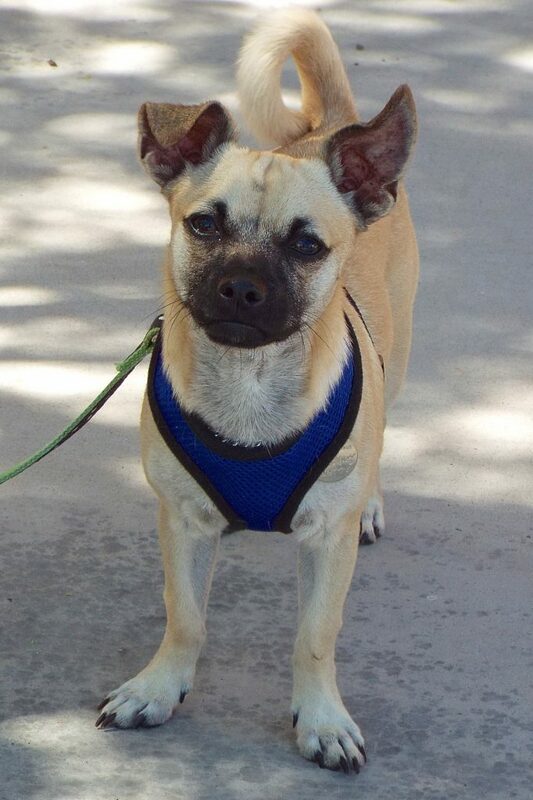 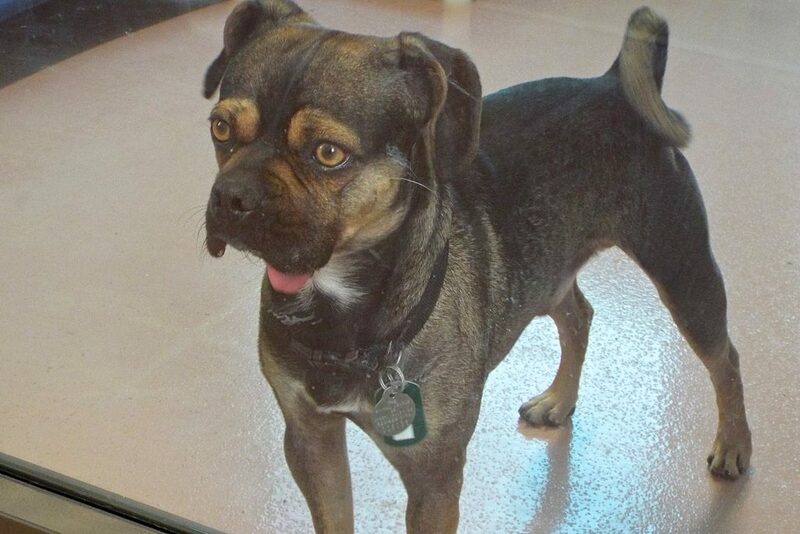 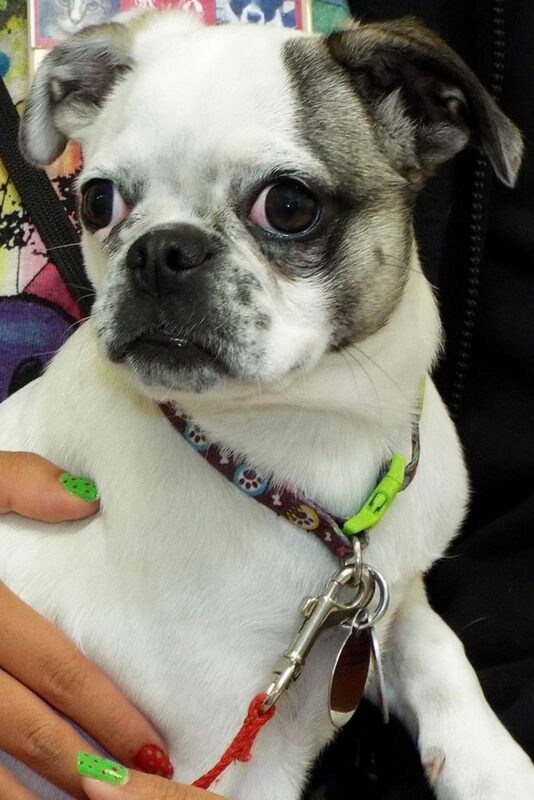 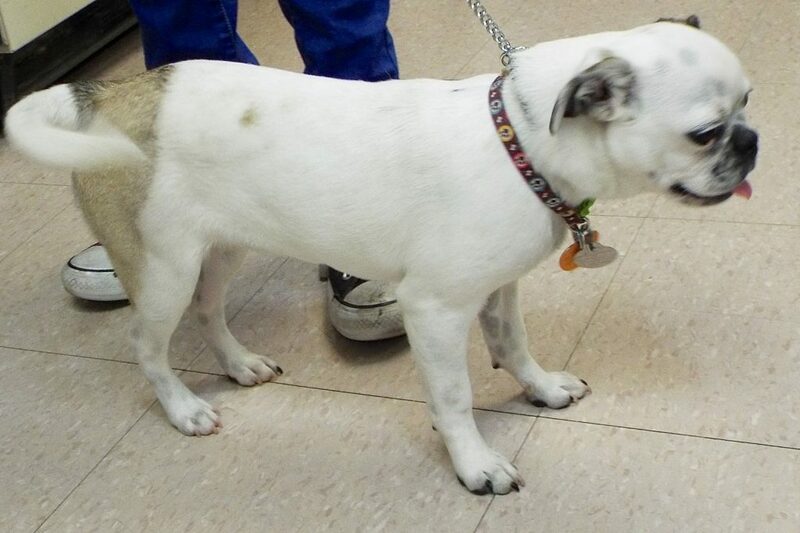 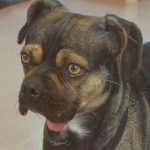 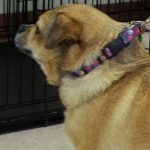 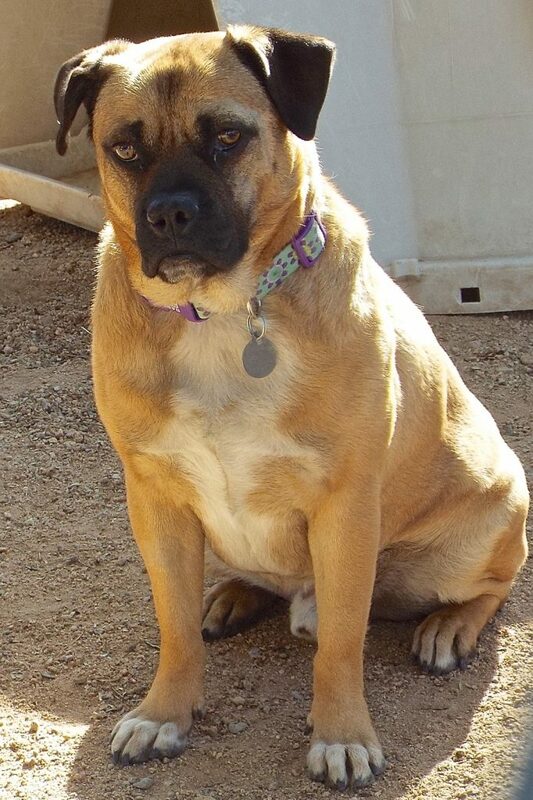 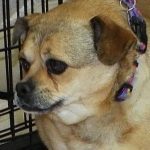 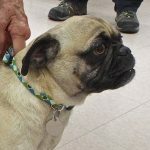 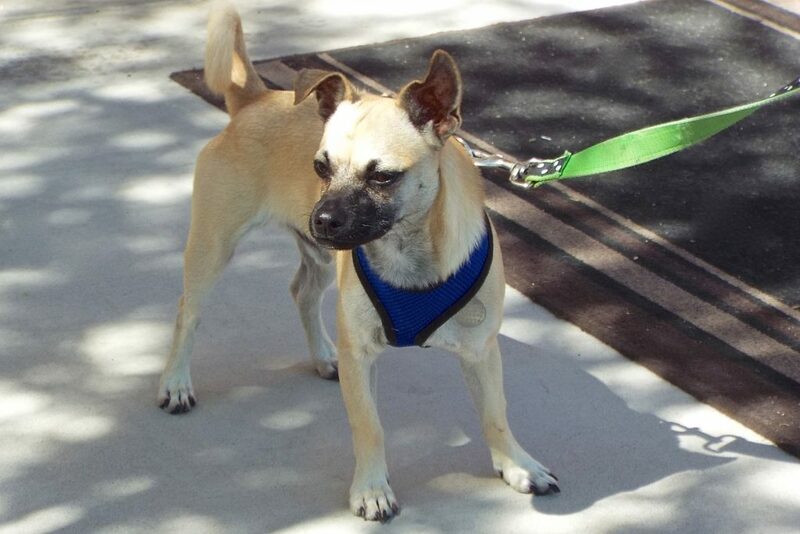 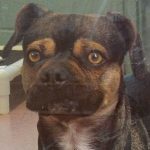 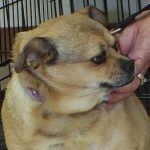 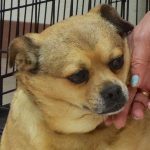 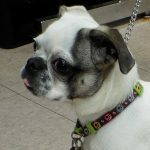 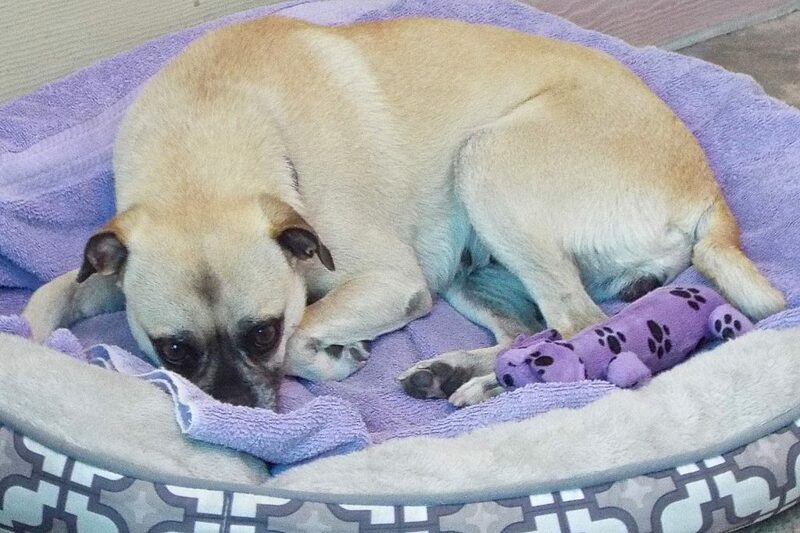 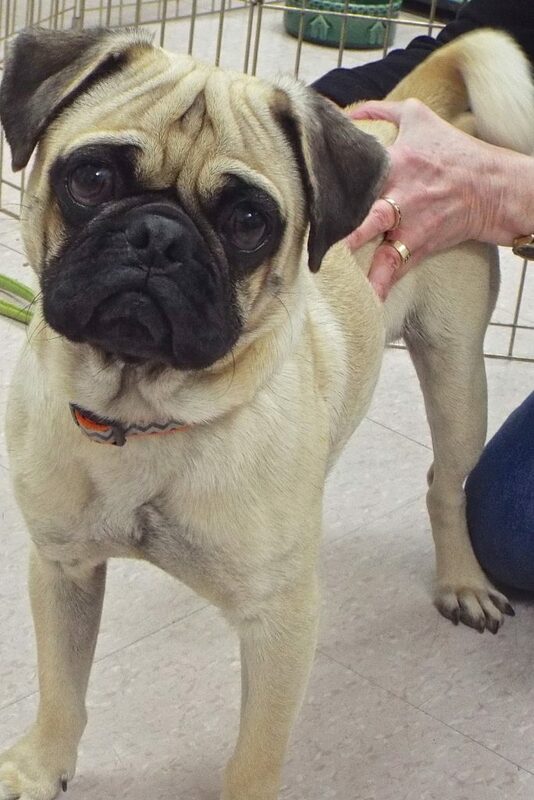 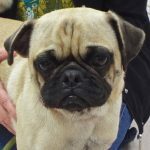 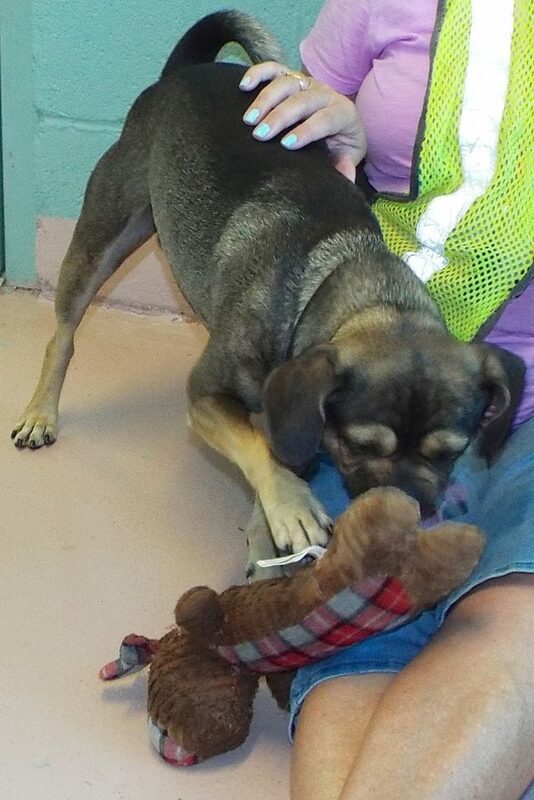 When I was found—a 1-1/2-year-old Pug mix male, 20 pounds—I was clearly lively and outgoing. 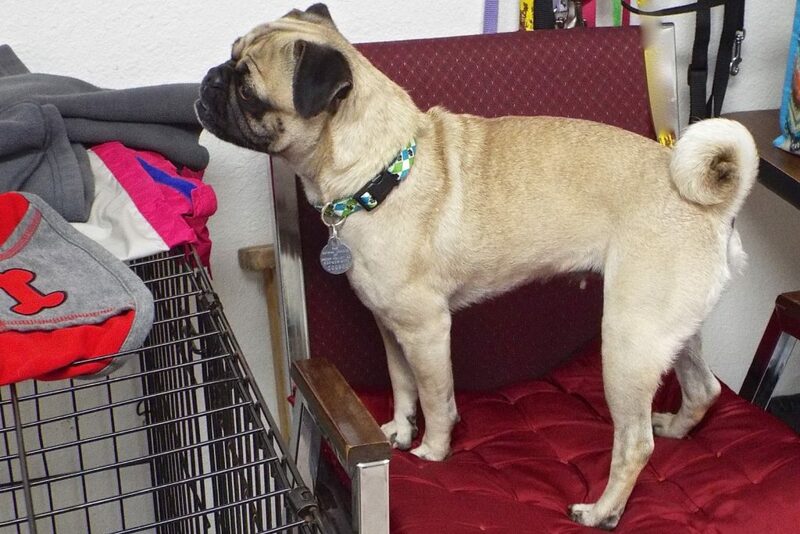 But the true inside scoop on me came from my foster family. 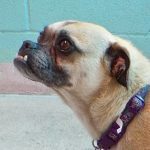 They discovered the real me and made a long list of my good qualities, like being great with their cat, a good buddy for chilling out on the couch, and having excellent house manners (they used the magic word “housebroken”)! 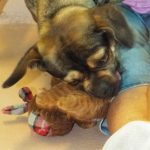 I’m good in a crate, love my toys, and understand some commands. 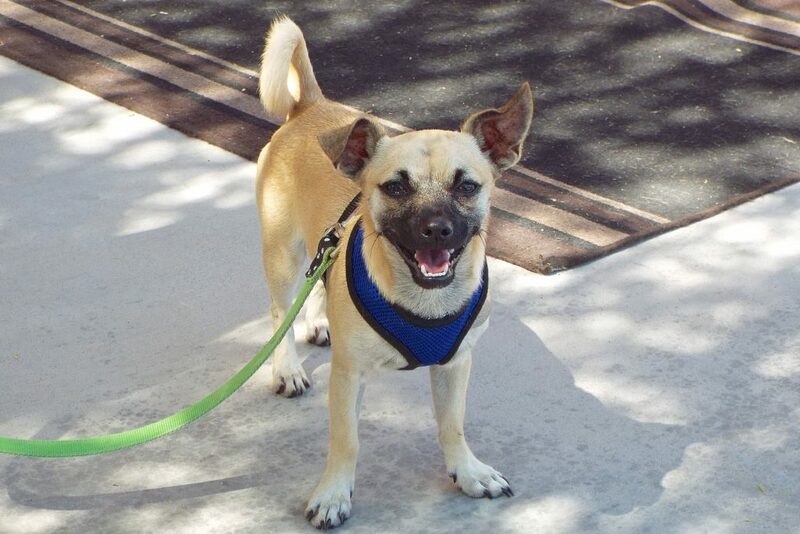 Granted, I could use more leash training, get overly excited when we see bunnies or birds (who doesn’t? 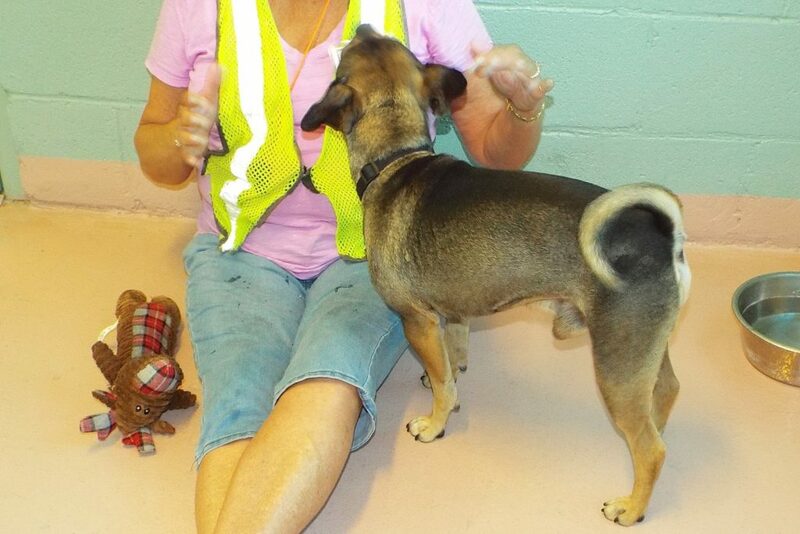 ), and sometimes I’m too excited around other dogs—may need to be an only dog. 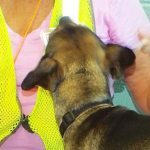 Best of all, I’m calm and affectionate with people because I love being with them. 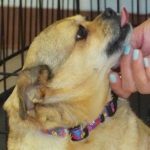 Could you love me back?